It's a little close to the roof but it seems to be giving sensible readings so far. I'm not that convinced about clamping two hollow tubes together but this is the method and clamp supplied. I had to fit a stand off bracket and it's still only about a metre from the chimney pot so not ideal. I think it may affect the temp readings in due North winds but we almost never get those and there is also the large building you can see about 100 meters in that direction to mess things up generally anyway. 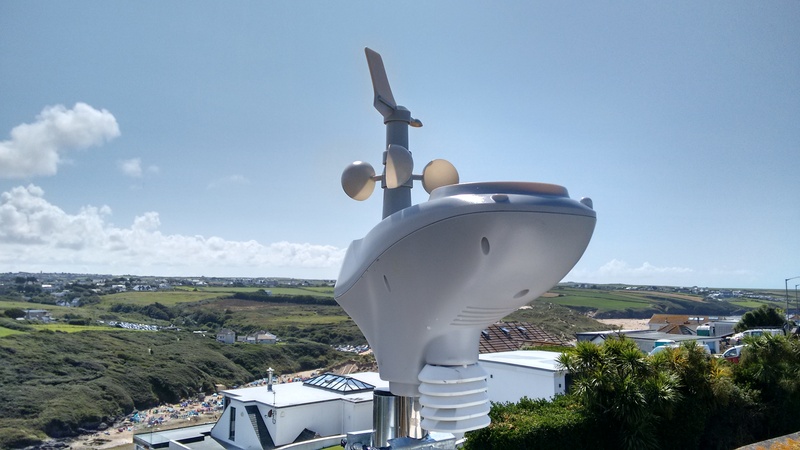 We are very exposed here to everything from South East to due West so what happens to the weather station during the winter storms remains to be seen! I also didn't like the idea of two tubes just touching each other, it kind of moves a little bit with only one set of brackets holding everything. So, I didn't follow the manual and made a slight change on the way it's attached to the pole. I used both brackets provided with the unit to hold the short tube that comes with the station, and then I used another similar bracket to hold it on the pole. That way it doesn't move. 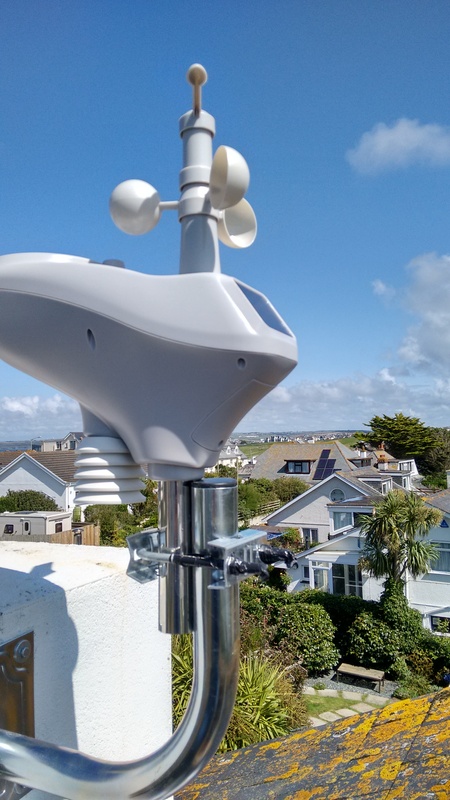 I'm going to keep a close eye on mine to make sure nothing moves, it certainly got a test yesterday as we are on top of a windy hill on the coast. 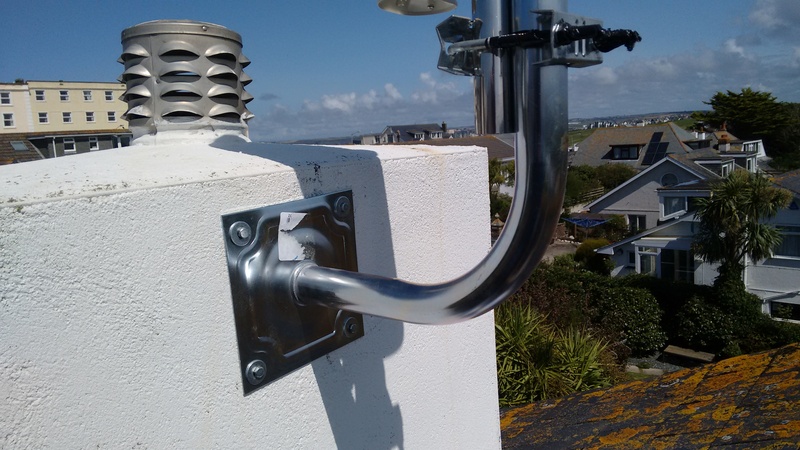 Before I got the stand-off bracket to keep the WS away from the chimney I was going to use a length of capped gas pipe I had, it it was a replica of yours. The tube supplied with the station should be inserted in the sensor opposite the one on your photo. The hole in the tube should hit the tongue which is in the housing of the station. Then put on a plastic ring and turn it 90 degrees. This will protect against rotation or fallout of the sensor from the tube. I did what the manual says, and the notches on the tube are inside the unit, as it should be. And locked in place with the ring. I got the roof unit on mine changed under warranty because the temperature sensor failed. The short chrome pole on the new one is a better fit up inside the unit and doesn't have the slight rocking the way the original had. Both were fitted correctly with the slot engaged and the ring fully locked. I'm hoping this new one will last longer than a month! you should be at the least 6 feet above roof line I would be happy with it. Well the replacement is still working. Every few months the temp sensor appears to be reading a few degrees too high but then it sorts itself out, but since the large retailer I got it from here in the UK (Maplin) went bust there will be no more free replacements. My station wind gust record is 70mph so far but I'm pretty sure it will see 100 mph if it survives a few more years.